Have you ever wondered how powerful chief executive officers negotiate their lucrative compensation packages? 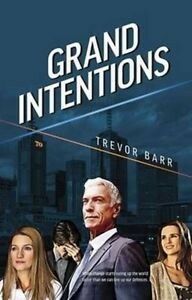 Grand Intentions by veteran internet and telecommunicatons scholar Trevor Barr shares their secrets. Barr’s gripping novel opens with the telecommunicatons giant Telco One in crisis: rural Telco One client Thomas Bowie dies of an asthma attack due to a technical line fault. In the aftermath, Telco One’s board fires its chief executive officer and hires Clint Mason – a mid-market CEO with experience at the United States telecommunications firms MCI and Sprint, a fundraiser for the Republican Party, and who has a keen interest in American Native Indian culture and history. Mason is tasked with spearheading Telco One’s privatisation and the operational transformation that is required to remain competitive. The first three chapters of Grand Intentions read like a negotiation masterclass: how Gordon Hunt (customer liaison and government division head), Nathan Thompson (a Telco One board member), and Jennifer Ralston (a Telco One board member and advocacy lawyer) deal with and disagree over the due diligence, compensation package negotiation, and rapid on-boarding of Mason and his operations manager Brad Botein. Australia’s prime minister, unions, and pension fund managers are carefully watching Telco One’s board. Each has a crucial role in vetting Mason’s appointment. Mason has a strategic vision for Telco One: to shake-up Hunt’s customer liaison activities and identify new revenue sources, to improve Telco One’s share price by dramatically cutting head count, and to build and roll out a Next Generation Network – in only nine months. He has a close eye on the successes of Apple, Google, and today’s visionaries like SpaceX’s Elon Musk. It’s a strategic vision of disruption that will also be familiar to shareholders of QANTAS, Commonwealth Bank, Rio Tinto and other companies who face a combination of industry, regulatory and technological head winds. Barr offers an informed insider’s view into the C-suite and senior management discussions that take place. In doing so Grand Intentions goes beyond media rhetoric about Silicon Valley disruption to convey the dilemmas and decision-making that business leaders face. Barr traces the impetus and fallout from Mason’s corporate revitalisation through a range of Telco One employees. Gordon Hunt champions a consumer advisory council that will get close to Telco One’s customers. Hunt’s exchanges with Mason and Botein in a performance review meeting are eye-opening in how he gains buy-in for the council initiative. Barr shows Mason and Botein’s commercial acumen and what they really privately think about Hunt’s council. Other Telco One senior managers like marketer Jasmine Spencer and networks and systems engineer Lars Sorenson have their own competing ideas and initiatives. Hunt hires counselors Paul Brooks and Max Groves to chair the consumer advisory council. Brooks and Groves are new to Telco One’s commercial world and they each grapple with Hunt’s neoliberal agenda. The council has to be solutions-based and identify new products and services. Brooks and Groves differ in their reactions to these pressures. Barr contrasts their experiences with their partners Karen and Nicole’s worlds of community radio and teaching. Barr also has a few important ‘reality-check’ comments about Mason’s decision to shutdown Telco One’s research labs and instead create a senior management advisory. In the newly privatised Telco One, researchers now need to generate new revenues and have fundable research programs. Researchers can no longer be a cost centre or be solely reliant on government grants. As Mason’s change agenda proceeds each of these characters faces career turbulence and ethical challenges. Some are able to thrive on the disorder and to emerge stronger: to be antifragile as philosopher Nassim Nicholas Taleb describes. Other characters make suboptimal decisions and must face the consequences. Mason’s change agenda thus acts as a sorting mechanism: a fictional depiction of the Tournament Theory process of economists Edwin Lazear and Sherwin Rosen, and the noncooperative Game Theory interactions of the late mathematician John Nash Jr (A Beautiful Mind). But Barr’s characters are not one-dimensional either, as Mason’s encounter with Aboriginal elder Amanyi Kunoth shows: he is deeply critical of Australia’s on-going mistreatment of its first peoples. Grand Intentions is filled with Barr’s commentary and reflections on why telecommunications is the underlying infrastructure for today’s internet economy. It’s an opportunity to be privy to conversations inside corporations about growth initiatives that capture and sustain the media’s attention. It’s a cautionary guide for MBA graduates on how to accumulate power, navigate organisational politics, and climb the career ladder. Finally, Grand Intentions is poignantly candid about the human costs and casualties of disruption, and what winner-takes-all really looks like. Grand Intentions is available in Australia from Readings and other good bookstores. Internationally, it is available from Book Depository (with free shipping), from AbeBooks resellers, and as an Amazon Kindle ebook.